Used RCAP2 Autopilot. I've never used it, but it has been bench tested. $45 without Garmin GPS cable, $50 with the cable. Plus shipping. Paypal preferred. Photo below shows unit with the Garmin GPS cable (which I'll include for $5 extra). The cable is long so that you can unsolder it and cut it to length for your installation. I didn't build the board. 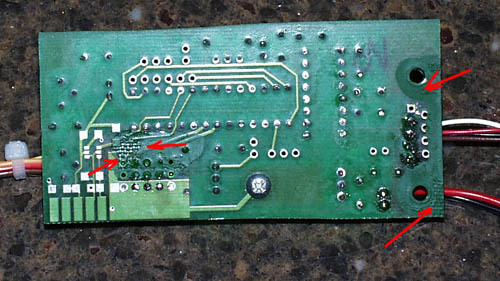 The solder side has some areas where the builder burned the fiberglass. I green tinted the areas to pretty it up a bit. The red arrows point where I did that. Although the burns look ugly (with the green removed), they do not affect the board's operation. Price reduced. Per first post. How many channels does it control? I suppose there is no support for altitude, just heading, is that correct? I would like to try something like this in my Easystar, but I'm not sure if this can work at all. What do you think? Is there a chance that it works with my EM-411? It's a GPS based auto-pilot rudder controller that connects to a waypoint enabled GPS. Details are in the link (see first post). 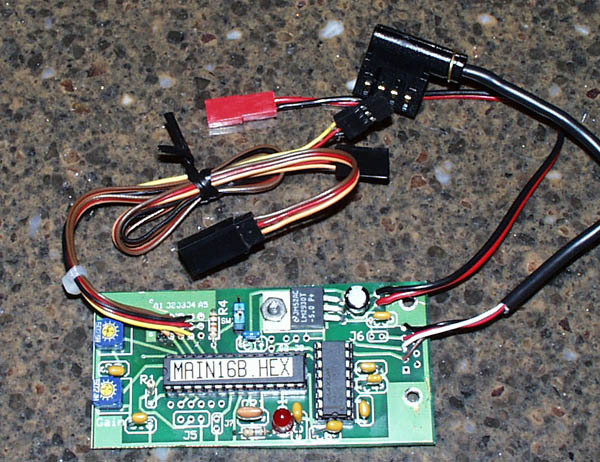 I understand that some folks have modified their RCAP for use with OEM GPS modules like the EM-411 by using MX's waypoint controller board.